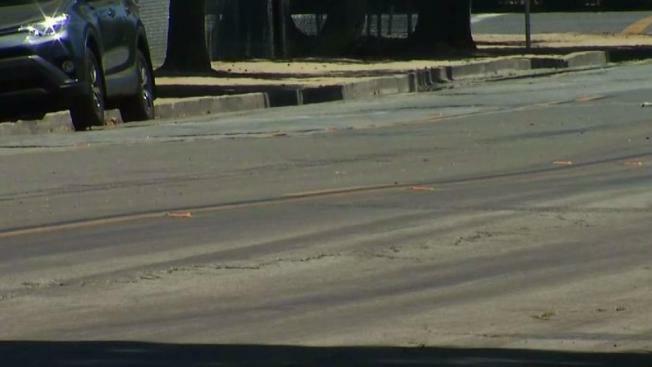 Residents of a typically peaceful San Jose neighborhood have been rattled this week by cars peeling out, tires screeching and engines revving as street racers have seemingly turned their roadways into racetracks. People living in the Willow Glen area, south of downtown San Jose, say they've been hearing the street racers for the past four nights in a row this week. While some residents are coping with the noise and intrusion, others are confronting those responsible. Some have complained about speeding and sideshows all along Pine Avenue, including the intersections around Bird Avenue and Coastland Avenue, near River Glen Park. Residents say things have gotten out of hand. Pine Avenue is riddled with skid marks and tire tracks from vehicles racing and doing donuts. The screeching and squealing tires woke up Casey Winsatt. "You hear, basically, people racing by at high speed," he said. "I’d come down and take a look, and I actually saw some kids doing donuts right out there; you can see the donut marks out front." Winstatt took cellphone video of one vehicle that was speeding off until the guys inside saw him recording. "A couple of them get out of the car, and they're sort of dancing around me and threatening me to get the phone," Winstatt said. "And they did threaten to come after me." Winsatt said he ran away. Other residents also took pictures of vehicles, but police told the Neighborhood Watch group so far the only detectable license plate was from a stolen car. Willow Glen activist Jennifer Jane Huber said the activity is getting more intense. "It just wakes you up because they’re speeding down here and then just flipping around," she said. "This is where they turn around, and it’s all hours. It can happen in the day, it can happen at night." Huber said her biggest fear is "someone getting killed."